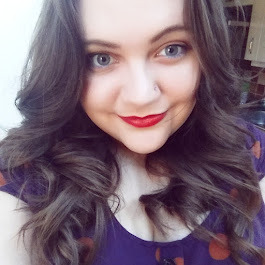 First of all, I apologise for the varying photo quality in this post, winter does not offer good lighting when I'm only home in the evening! Christmas is all about warmth and cosiness in my mind and nothing gives that extra special feeling in the same way as home made decorations, whether they be using dried fruit, pine cones, re-purposed toys, or any other item. 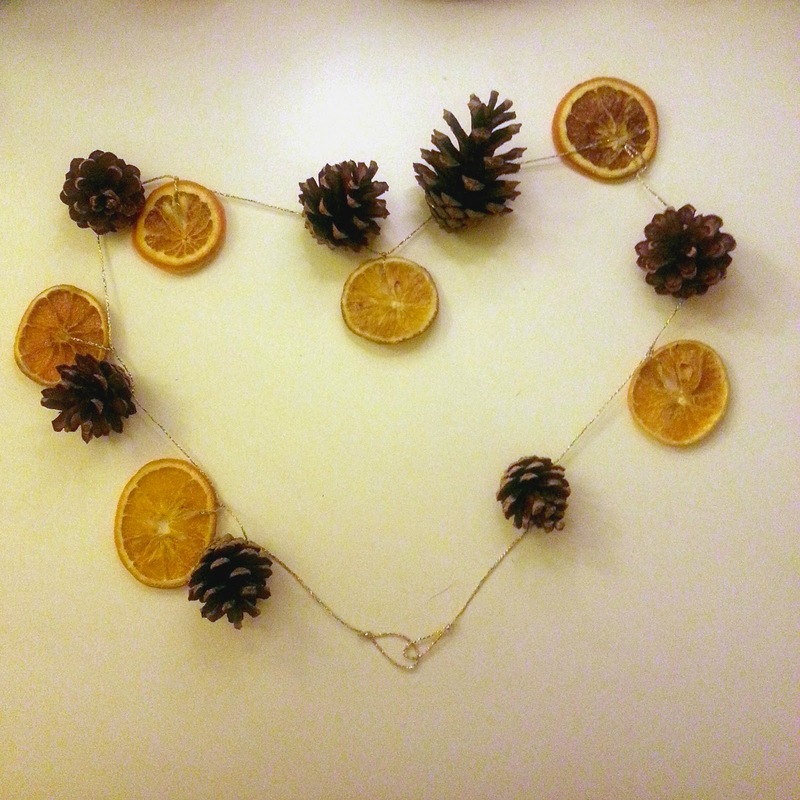 This year I have made several different types of home made decorations, including these which use oven dried orange slices. The first step is to dry your fruit. 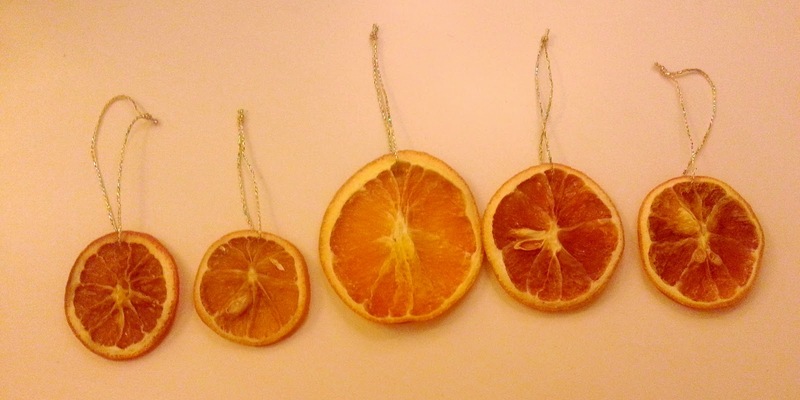 You can use apples, pears, lemons or limes instead, but to me, Christmas is all about the orange! To dry the fruit you need to carefully slice it into 1cm thick slices. it is best to cut citrus fruit crossways so that you get the pretty cross section of the segments. Place the slices on a non-stick tray (or on baking parchment) and bake on the lowest heat setting for 8 hours, turning occasionally for an even bake. They may need a little longer depending on the oven so use your own judgement. After baking, leave overnight to dry out any last moisture. If this step is too daunting or time consuming then ebay have lots available for not too much money! 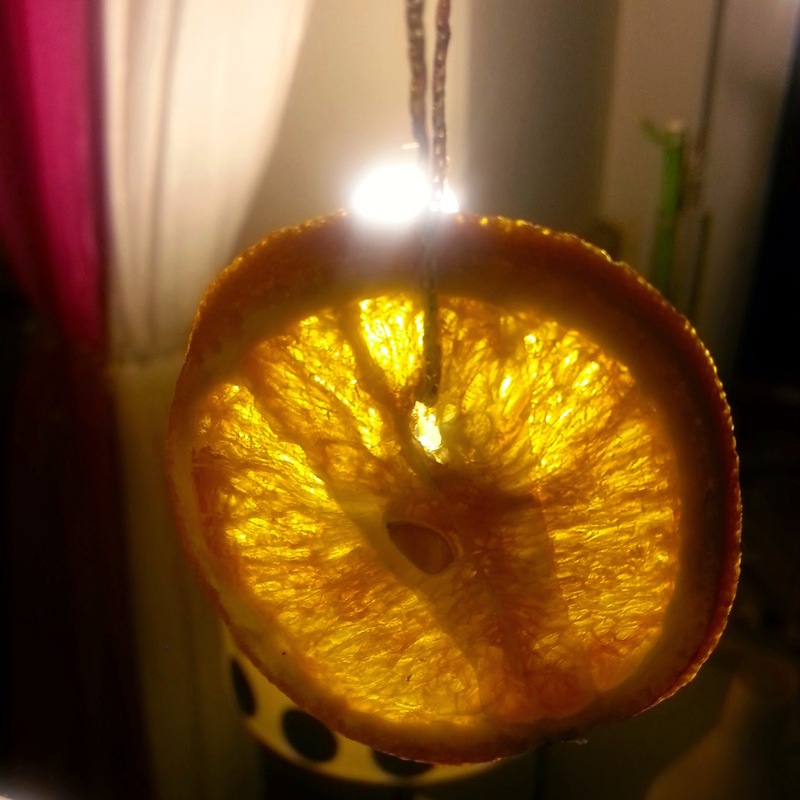 When dried, the orange slices will smell similar to marmalade which is pretty festive in itself! If you want to make the slices more hardy then coat with a thin layer of clear drying glue. I like to make sure that our house is filled with festive smells so I used a little paintbrush to dab a small amount of the Poppyfields Essence of Christmas (which is the best scent in the world by the way!). 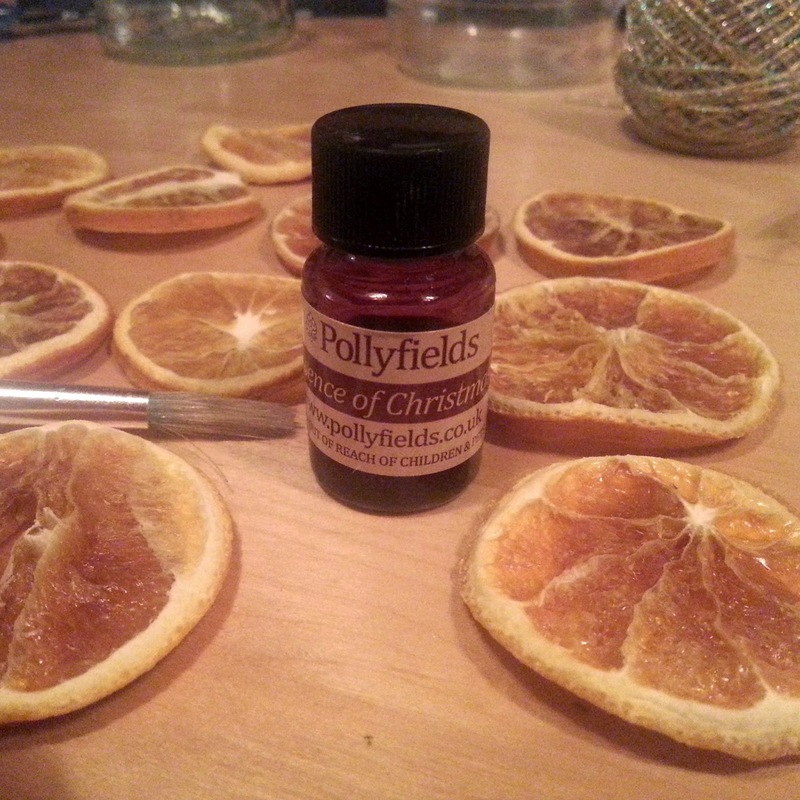 You can grab a bottle *here* for £5 should you wish and a small bottle lasts literally years :) After scenting the slices seal them in a freezer bag for a few hours to absorb the oil and let the scent mingle. Once scented, simply make a small hole using a knitting needle or pencil tip and thread using some pretty twine or ribbon. Some slices may already have a hole in the centre from when drying, if so, make use of that :) Then just enjoy watching them glow like stained glass when light shines through them. If you use them on your Christmas tree, place them near lights so see them glow and also warm them slightly allowing the scent to release itself and fill the room. What do you think? Aren't they pretty? Do you ever make your own decorations? In case you're picking, would you rather have raisins, or crisp grapes? It might astonish for you to discover that there are contrasts between dried foods grown from the ground organic products.